This living room has an atmosphere of understated sophistication. It’s no secret that paint is one of the most cost-effective and simple ways to drastically transform a space. 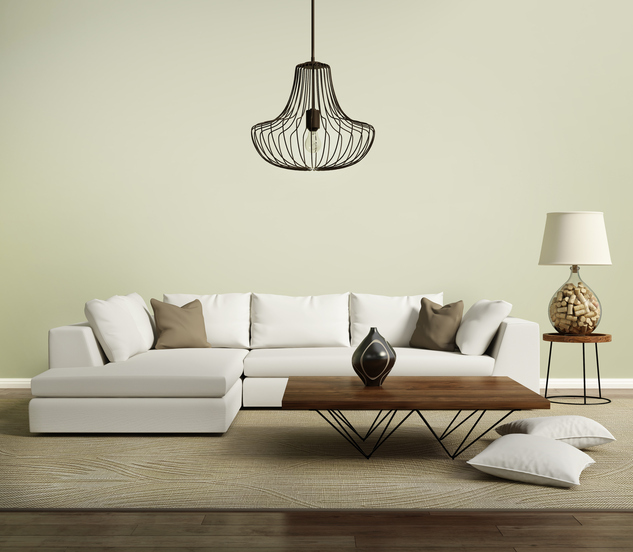 Whether you want to make a space look bigger, more unique, more modern, or more inviting, selecting the right paint for your tastes and needs is key. However, you not only have to consider hue but finish as well. Matte paint is on trend because of its unique finish. Thinking about trying it out in your home? Here are some tips on how to take the plunge. Due to the advanced technology of premium paints, matte finishes are now as durable as semi-gloss finishes and can be used without fear in humid and high-traffic areas. They are very forgiving and do not display marks and other imperfections as easily as their more popular glossier counterparts. This is part of why they are gaining popularity. The soft rich look of matte paint can make it ideal for plush, muted, and dreamy effects in home decorating. When utilized in combination with metallic frames and high shined fixtures, matte allows these eye catching objects to truly pop. This unique contrast makes any space look modern and balanced. Matte paints are high in pigment, which means that they offer full coverage regardless of what color you choose. While glossier finishes make bold and dark colors overwhelming, matte paint can mute these colors, making them far more useable in diverse home applications. Matte paint allows you to play with stripes in an eye catching and fashion forward way to create visual interest. Using glossier and matte paint in the same shade will create eye catching stripes that appear to be in two different shades. For a more dramatic look, mix finish and color. These are surefire ways to guarantee a unique look that sets your home apart.